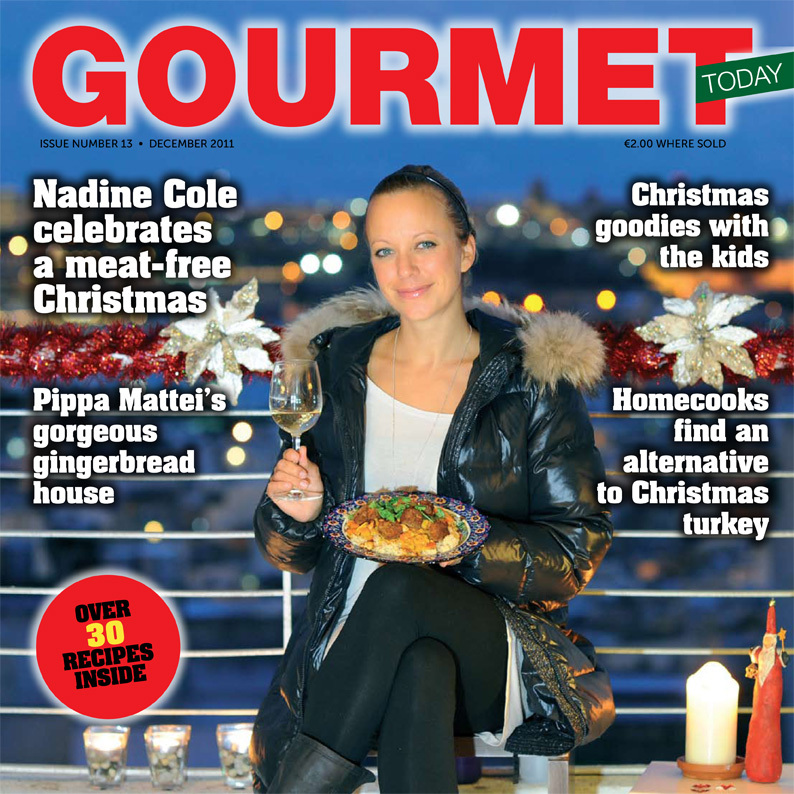 as promised i want to share my recipes for a vegetarian xmas menu with you. 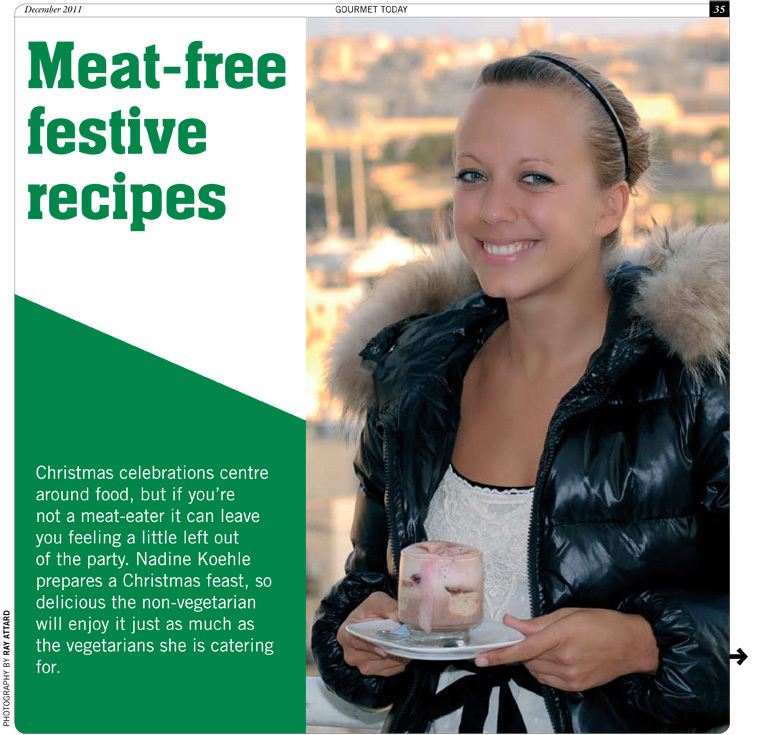 the menu was published last sunday 4 december 2011 in the GOURMET TODAY magazine which comes out once a month with the MALTA TODAY newspaper. eventhough i am not a vegetarian myself i love vegetarian cooking with seasonal vegetables and loads of spices and herbs… hope you’ll like it! 2. heat up the stock, add the mashed chestnuts, puree with a blender, add cream, heat it up slightly. 3. finish it with little pieces of cold butter to bind it and season with salt, pepper and a hint of cinnamon. add a splash of white wine or prosecco and puree it a last time so it gets frothy. 4. in the meantime heat up a little pan and fry the mushroom slices and onions. season with a hint of icing sugar so it gets caramelized.. add the crushed hazelnuts. 5. put the soup in bowls, add the topping, a blob of purreed raspberries and finish with just a tiny hint of hazelnut oil on top. 1. start with marinating the tofu. cut up in small pieces and add masala powder and tamari/soy sauce. put aside for later. 2. heat up the oils in a big pan. crush cumin and coriander in a mortar. roast them in the pan, also the mustard seeds until fragrant and they start popping. add chopped onions and ginger, roast on medium temperature. add garlic and stir. 3. Add the veggies and the lentils. roast and add the powder spices. add the chopped chilies. top up with vegetable stock. let it simmer for about 20min. add tamari or soy sauce at the end depending in your taste of saltiness. 4. in the meantime prepare the couscous as described on the package and add olive oil, lemon and salt or a bit of vegetable stock for more flavor. 5. heat up a pan and fry the marinated tofu. add the cashew nuts and roast them together. 1. cool sugar sirup after you made it. 2. whip up the cream in the meantime. whisk egg yolks over boiling water until frothy. add the cinnamon and put the bowl in cold water, whisk until cold. add a tiny bit of rum. 4. for the stewed plums cut plums into quarters, coat them with brown sugar in a small pot and let them caramelize. top up with water, add the spices and let it slowly cook for about 20-30min. 5. take out the parfaits ca. 30min before you need them. warm up the plums and put them on top of the cold parfait. 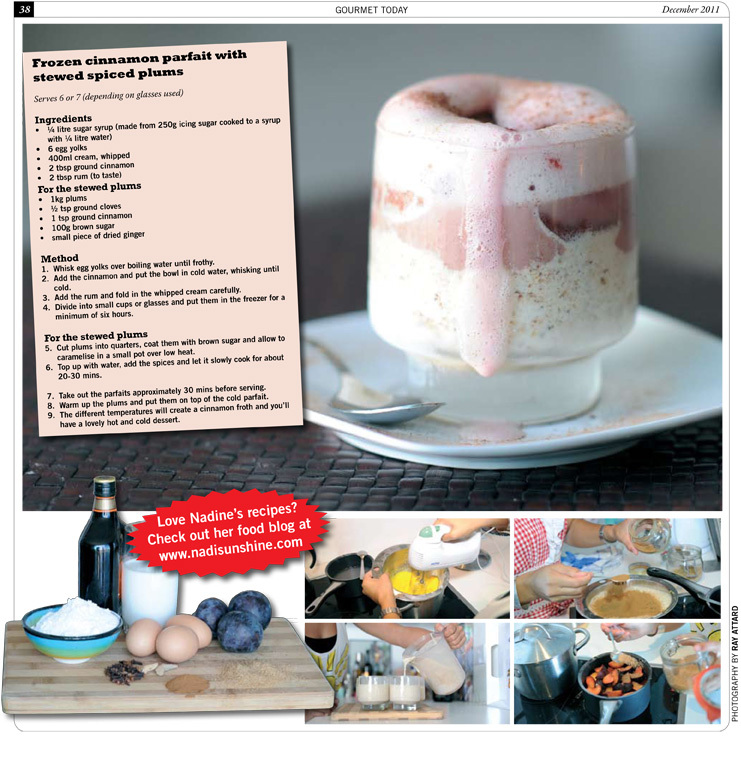 the different temperatures create a cinnamon froth and you’ll have a lovely hot & cold dessert. delicious! .. this is how my beloved friend e described yesterday night’s dinner in our big guest book. how sweet is that??? full of funny stories and self drawn pictures, this book with its little notes, mostly taken at a very late stage of the evening, got a true companion over the last two years in vienna and now in malta.. we should reallyget it out more often..
anyways, to be honest. i love vegetarian food a lot, so it was not a problem, but more a pleasure to cook a vegetarian menu for our dear guests… also, the dishes were all very easy and quick to prepare, this is just how i like it most: relaxed, unpretentious cooking, 2h of preperation time without a hurry and still some time to enjoy it! especially now, as the nights get longer and it gets dark earlier, i like to cook and invite friends over even more than in summer.. always with me on the kitchen desk: my little red cook book with all my recipes (my mum gave it to me ages ago for christmas), i little nibble (a hungry cook is a bad cook!) and a glass of wine (well, just because i like it!).. how shouldn’t this bring you in a great mood!??! as a starter i made my jerusalem artichoke soup (wrote about it last week) and as a main i made an asian red lentil curry with couscous with tons of fresh veggies and spices. for desert we had our all time favourite: crumble with pumbs and lemon mascarpone cream. check out more details in the mouse over text when you move your mouse over the image!